Each year I tell myself that I'm going to have a cookie swap but then it never happens. I'm so excited to get this free ereader book, Gooseberry Patch Cookie Swap Cookbook early enough to help me actually do it this year. The cookbook starts of with Hints for a Successful Cookie Swap. The time frame of planning starts 6 weeks before the event. That is good to know because, honestly, I had no clue when or where to start. The planning stages in the book takes you all the way to 1 hour before your event! I love the idea that everyone is to bring copies of their recipe. I am so excited for my cookie swap. I am going to actually invite the people who I know are young moms, young women who do not have a lot of baking experience. I think this will be a good way for them to get recipe ideas and a variety to share with family and friends. Through out the book there are other tips & ideas for your cookie swap. On to the recipes! The book contains Classic cookies that work great for a cookie swap. Some of the tasty recipes include Merry Spritz-mas Cookies (I've never made these), White Chocolate Raspberry Diamonds, Peppermint Cookie Wands, Linzer Tart Cookies (I make a similar version of these every year and they are a HUGE hit), Nutty Butterscotch Squares, Sparkling Orange Snow, Sweet Chocolate Toffee Delights and Homemade Chocolate Caramels. There are plenty more in the book! Get it while it is free. If you miss out on the free deal the book will be under $3 which is worth all the cookie swap ideas and new cookie recipes! Enjoy friends. Find it on Nook, Kindle, Sony, Apple. I'm a huge Gooseberry Patch friend. Click here at GOOSEBERRY PATCH, to find out about more of their cookbooks right here on my blog! Leave a comment and let me know you stopped in. I'll visit you back. Want a sneak peek recipe? Here is one for you from this cookbook. 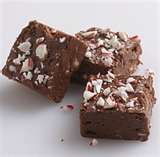 With my sweet tooth, I just can't resist any candy recipe.